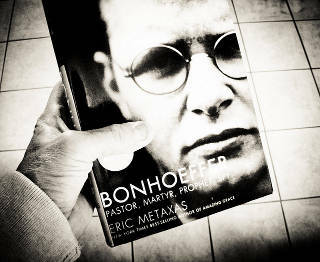 Dietrich Bonhoeffer was not exactly a theologian who kept his head in the clouds. Bonhoeffer was an anti‐Nazi dissident who used his influence as a pastor against the atrocities of the Nazi party at every opportunity—to the extent that he was executed by the SS in 1945. This race that is set before us is not a race to satisfy the desires of our human nature, by some supposed permission granted to us though God's grace. Quite to the contrary, we are to no more hang on to the desires of our flesh in our race than a professional runner would hang on to a pair of heavy work boots in his or her race. From those old‐covenant saints, recorded in Hebrews chapter 11, to such contemporaries as Dietrich Bonhoeffer and Corrie ten Boom, men and women have given everything they have to that race. And because of their testimonies we should be as willing to cast off every bit of extra baggage we carry and the sin that trips us up. And we should run our own race with patient continuance—never stopping or giving up. So what is the motivation to take on such a burden? Well, it's only a burden if we think of it as another obligation to the Lord. But it's not a burden if we take it on in the presence of the Lord. As I have taught on for the last few days, holiness (or godliness) is not an obligation on our part toward God. It is not another “to do” list that God requires of us in order to please Him. Holiness is a position that we take in our relationship with the Lord. Now it shall come to pass, if you diligently obey the voice of the LORD your God, to observe carefully all His commandments which I command you today, that the LORD your God will set you high above all nations of the earth. Blessed shall you be in the city, and blessed shall you be in the country. Blessed shall be the fruit of your body, the produce of your ground and the increase of your herds, the increase of your cattle and the offspring of your flocks. God illustrated this position to me a couple of weeks ago, described in Monday's article—as I will briefly restate. After being on my hands and knees for a few minutes, I started to feel the pain in my kneecaps. At this point, I realized I could sit back on my heels and still be obedient to the Lord's direction of kneeling on my hands and knees. When I sat back on my heels I immediately realized that this is the position I would assume if kneeling in submission before a king. After a few more moments of silent thought the word “holiness” came flooding through my mind. “Wow!” I thought to myself, “God is going to pass by me just like He passed by Moses!” And so I braced myself for the glory of the Lord. But nothing like that happened. Instead, a few more moments passed by, with me just staring at the carpet in a dark room. Suddenly, as I looked down I was looking down over the face of the earth. In other words, nothing was above me but God. Nothing was above me but a Holy God. And I could feel His holiness touching me—as if He was resting on my back (actually, more like I was being sucked up against His holiness). At this point I realized that I too was holy, as He was holy (see 1 Peter 1:13–16). I tested this out by trying to deliberately bring up some of the crap that sometimes gets entertained in my mind. But nothing would come to me that was not of Him. I was pure. I was holy. I was set apart from the things of the world in His presence. Please consider the possibility that casting off your excess baggage and the desires of your human nature could become a joy rather than a pain. Where's the motivation to do so—if you think that running the race is just another obligation on your part? But wouldn't running the race become a joy if you realized you could position yourself in the presence of the Lord—a place where you can run with His strength and His endurance.